The Donations Received report is your classic What Donations have come in? report. With a variety of filter options and export functions, this will be your quick go-to report on where your finances stand. The Donations Received report will list each donation that fits the criteria you’ve entered (if John Smith made two donations that fit that criteria, both donations will be listed). Looking for a Summary? Use the Reports > Donation Activity > Donations Received Summary report if you want to summarize donations (if John Smith made two donations that fit the criteria, his name will be listed once with the total of both his donations). Here’s a video covering the Donations Received report. Choose your Date Range. 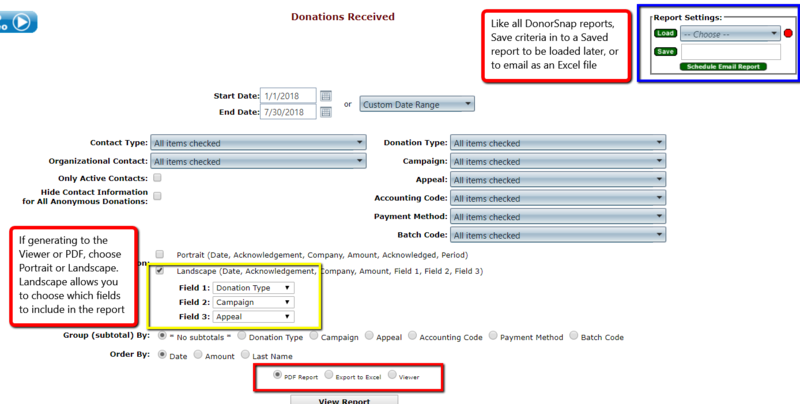 Filter options for what to include of DonationTypes, Appeals Campaigns, etc. If you are using the on-screen Viewer or PDF, choose if you want Portrait or Landscape (and with Landscape you can choose which fields to display). ** Note that if you export to Excel, ALL fields, including multiple Contact fields (Address, Phone, Email, etc.) will display. Each user can have multiple “Saved Report”, ie. Monthly Donations, Membership Payments only, Income NOT including InKind/Grants/Soft-Credits. For example, if you want to build a Monthly report of all donations, change the date-range to a Custom date range (such as Last 30 days, or Last Month). Title and Save this report at the bottom of the page. Saved Reports can be loaded at a later date, at the top of the page. Saved reports are accessible for That User only. Go to the Save Reports page. Once a report has been saved, you can Schedule Email report using the Blue Schedule Email report button that appears near the PDF/Excel/Viewer exports. Type in the name to email to, Frequency, and Date Range (such as the 2nd day of the month through the end of the year). Excel Files of the report will be emailed. Go to the Email Reports page.